First Edition. Signed by Marc R. Mantrana and Robin S. Lattimore on the first front free endpaper. 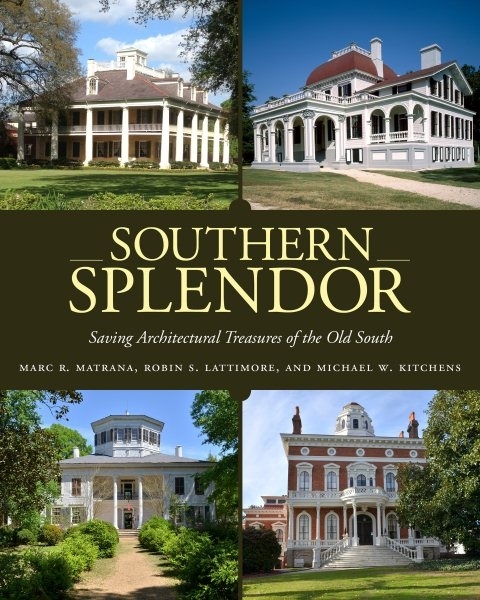 An illustrated exploration of the legacies and restoration of historic antebellum homes in the South. Marc R. Matrana, New Orleans, Louisiana, practices medicine at the Ochsner Medical Center and is an active preservationist and historian. He is author of Lost Plantation: The Rise and Fall of Seven Oaks and Lost Plantations of the South, both published by University Press of Mississippi. Robin S. Lattimore, Rutherfordton, North Carolina, is a high school teacher and author of more than twenty-five books, including Southern Plantations: The South's Grandest Homes. In 2013 he was bestowed with North Carolina's Order of the Longleaf Pine. Attorney Michael W. Kitchens, Athens, Georgia, is involved in preservation efforts and is author of Ghosts of Grandeur: Georgia's Lost Antebellum Homes and Plantations, the 2013 Gold Medal Winner of the Benjamin Franklin Award for Best New Voice in Non-Fiction.